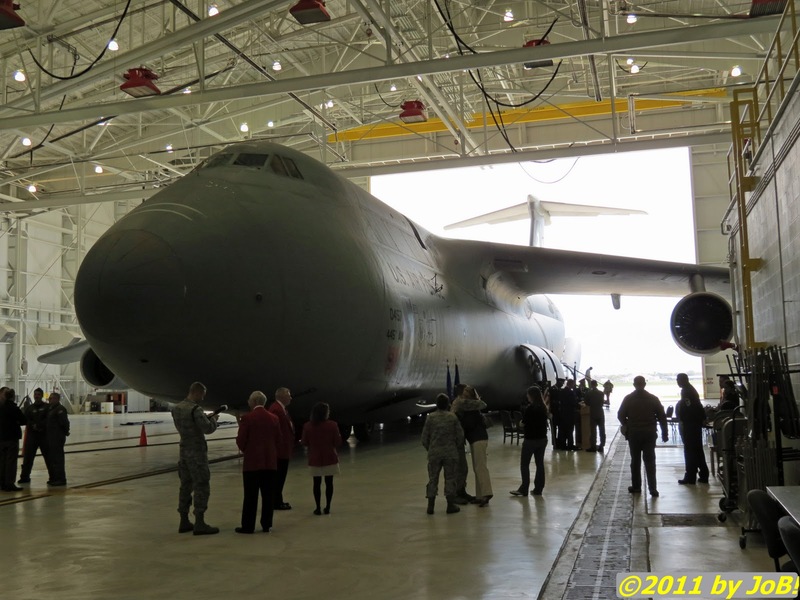 Attendees viewing the C-5A ‘City of Fairborn’ prior to the start of the ceremony. 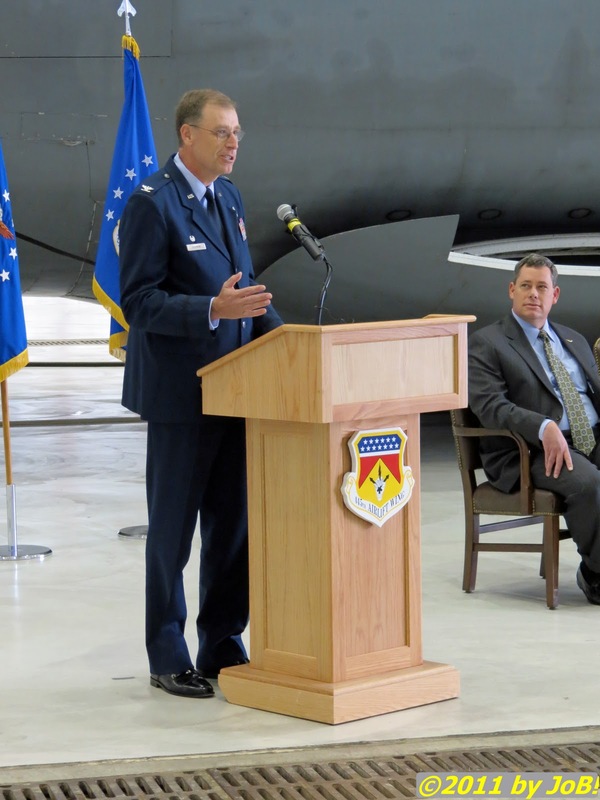 The 445th Airlift Wing flew the Lockheed Martin aircraft for nearly six years out from the southwest Ohio base. On a near perfect autumn afternoon, approximately 100 people came to say goodbye to a familiar friend of the Wright-Patterson Air Force Base community for over the past six years. 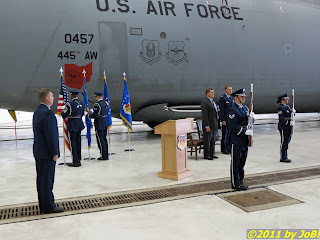 Last Friday, the base’s 445th Airlift Wing held a farewell ceremony for the C-5A Galaxy transport aircraft, the largest in the US Air Force’s fleet. Wing commander Colonel Stephen D. Goeman hosted the event at Hangar 4016 near the base flightline and tail number 00047—dubbed ‘The City of Fairborn’—served as the backdrop for the event. Members of the base honor guard posting the colors for the farewell ceremony. 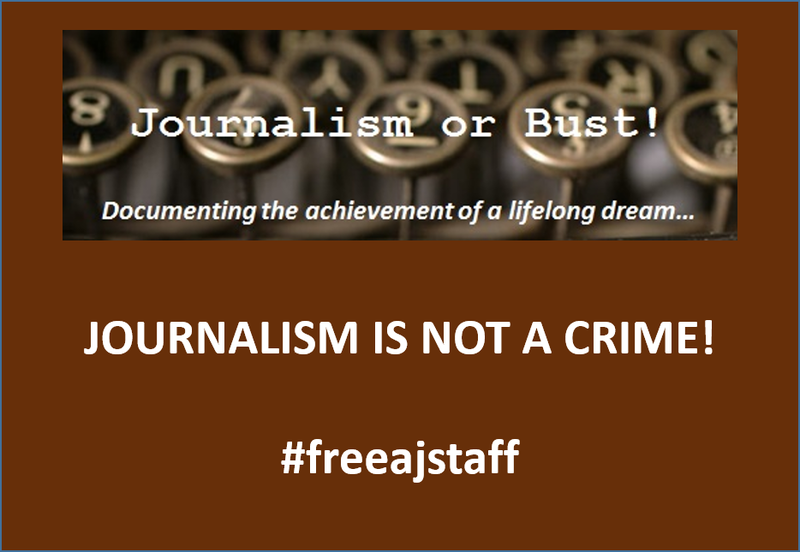 and Colonel Stephen Goeman are on the right. 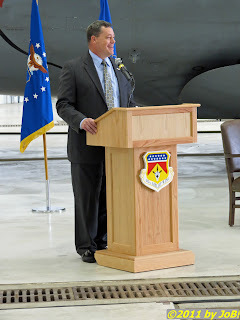 Mr. Greg Ulmer, vice president and C-5 program manager for Lockheed Martin, was a special guest for the event. Lieutenant Colonel Richard Webster, commander of the wing’s operations support squadron, served as master of ceremonies. In addition to various base officials, several mayors and public officials from cities surrounding the base were in attendance as well as the military affairs director for US representative Steve Austria (R-OH7). The Wright-Patterson base honor guard posted the colors for the ceremony and Chaplain Marshall McClellan provided the invocation. Colonel Goeman, 445th Airlift Wing commander, speaking at the wing’s C-5A farewell ceremony. In his remarks, Goeman expressed his personal regrets concerning the plane’s departure but reiterated that it will not be leaving the Air Force’s inventory. “There is an insatiable need for airlift, especially the airlift the C-5 can provide” and he said that the transport would probably outlive him in meeting the nation’s strategic airlift needs. addresses the attendees at the ceremony. Mr. Ulmer next mentioned the accomplishments and records the C-5 fleet set during its 40-plus years of service. He highlighted the base’s short but significant portion of that span stating, “wherever the Super Galaxy is delivering humanitarian relief, oversized cargo or critical supplies, Wright Patterson’s fingerprint is a legacy that will be seen forever.” Many of the Air Force’s existing C-5A and C-5B aircraft are being retrofitted with new engines and avionics components to upgrade them to the C-5M variant. 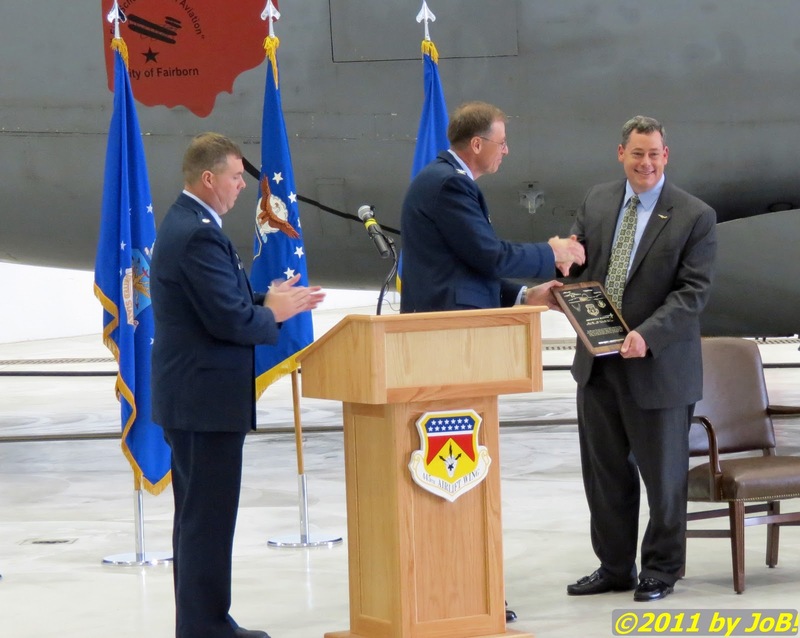 Colonel Goeman, center, presents Mr. Ulmer, right, with a locally produced plaque to recognize the C-5A farewell occasion as Lt. Colonel Webster, left, looks on. At the conclusion of Mr. Ulmer’s remarks, Colonel Goeman presented him a plaque created by unit maintenance personnel to commemorate the occasion. After the ceremony, attendees were allowed to board the hangared aircraft and get one last chance to see it up close before it is flown to Arizona to be retired. 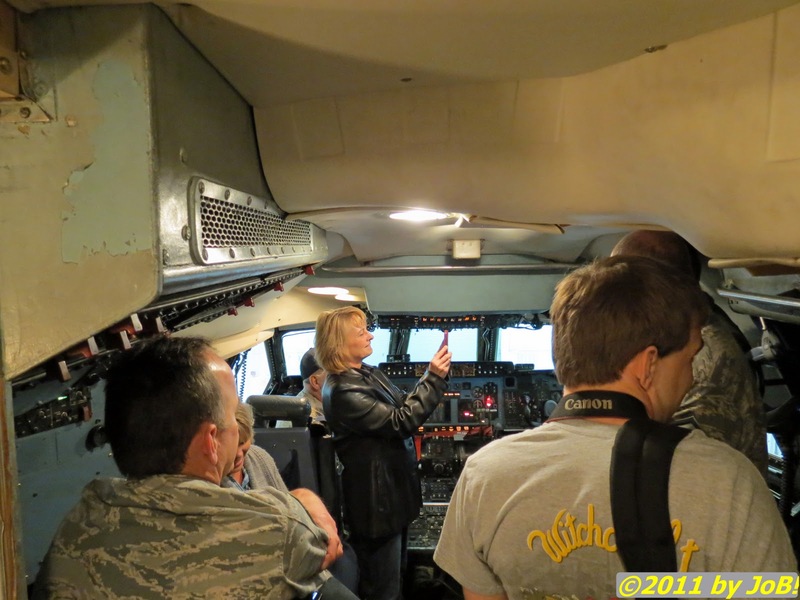 Attendees tour the flight deck of the C-5A Galaxy ‘City of Fairborn’. 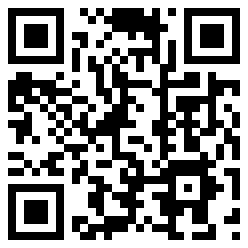 This aircraft is scheduled to be retired from service by the end of 2011. Introduced in 1970, the C-5A Galaxy serves as the US Air Force’s largest airlifter. One of the world’s largest aircraft, the plane is capable of carrying 36 standard cargo pallets and over 80 passengers while performing its intercontinental missions. As replacements for the unit's aging C-141 Starlifter fleet, the 445th Airlift Wing’s first C-5A missions flew in October 2005 and their final operational flights occurred late last month. The two remaining aircraft will depart the base before the end of the year. The local Air Force Reserve wing began its transition to the C-17 Globemaster transport aircraft in June 2011 and will have a total of eight on station by the end of September 2012. 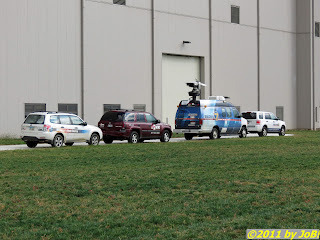 All of the Dayton-area television outlets covered the event. 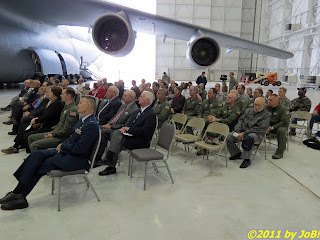 Some of the members of the Wright-Patterson community who came to say goodbye to the C-5A Galaxy fleet.